Usually a window AC unit is meant to cool a single room. 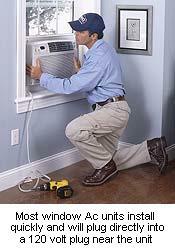 The window AC unit communicates directly with the outside for venting out the interior warm air. Due to their relatively simple installation, a window air conditioner does not usually require the services of an hvac contractor. This is a project usually taken on by the homeowner himself. A window AC unit is self-contained. All components necessary for operation are encased in the unit's cabinet. Buy a window air conditioner! Mount it! Plug it in! and Enjoy it! Newer models are becoming more efficient each season. The efficiency of a window air conditioner is measured by EER (energy efficiency ratio). EER is the ratio of the cooling btus/hr to the power input, in watts. The higher the EER, the more efficient the unit. A higher EER also translates to a higher purchase price, but the less energy it will consume, which you pay for directly. Choose a window cooler with a minimum 10 EER rating. Here the problem comes in. True sizing for cooling a space requires a Manual J calculation. Few people are going to go to that extent when purchasing a window AC unit. The full Manual J calculation can cost as much as the air conditioner, however a block calculation for equipment sizing only can cost as little as $75.00. Perfect Home Hvac Design can provide this service for you. "Rule of Thumb sizing" says for every 500 square feet of floor space, figure 1 ton of cooling. 1 ton of cooling equals 12,000 btu/hour. This "Guesstimation" should work well with older homes with little insulation, and high infiltration (loose construction, not sealed well). If your home is newer with good insulation, good double pane windows, adjust your "guesstimation" for less cooling. An example: An older home with single pane windows and no upgraded insulation has a room 25' x 10'. The owner wants to install a window AC unit. So the square footage is 250 square feet. 250 square feet = 1/2 ton of cooling or 6,000 btu/hour. 1) Filters need servicing often. Purchase a unit that the filter is easily serviceable. 2) Consider the room's sun exposure. If this room gets drastic afternoon sun, you may need to increase your capacity to compensate. The opposite is true, as well. 3) Buy a unit that has a thermostatic control, instead of just an incremental switch. This gives you much more flexibility for finer temperature adjustment and nighttime set-back. 4) Buy a unit with multiple fan-speed settings. 5) Get a good warranty, and purchase the extended warranty if one is offered. Stick with brand name manufacturers. They are better built and will last for many years to come. Please note: We do not promote or agree with "Rule of Thumb" sizing practices. The homeowner should weigh his options carefully before purchasing any air conditioner without a proper load calculation for his home.